1. 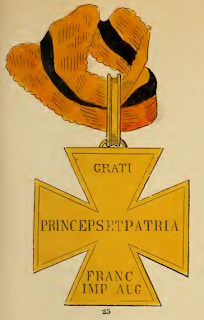 The Civil Cross of Honour. This, of all the decorations of honour in Austria, deserves peculiar notice. It was founded by the Emperor Francis I in 1814, and distributed personally by him on the 26th May, 1815. It occupies the first rank in public estimation next to the Orders of Theresa and St. Stephen, and forms a sort of transition from Orders to decorations of inferior degree. It was conferred as a civil honour for zeal and merit displayed during the critical years of 1814 and 1815. A committee of several Ministers of State, under the Presidency of the Minister of Justice, Count Wallis, had been formed to judge of, and enquire into the merits of the candidates. Only two hundred out of four thousand competent candidates were honoured with the Cross. The strict and rigid enquiry into the merits of the candidates has caused this distinction to be highly prized by the public. Upon the obverse of the Cross (Nos. 25 and 29) are the words: "Libertate Europae asserta 1813-14" (Europe's liberty maintained), and upon the reverse: "Grati Principes et Patria, Franciscus Imp. Aug." (the Prince and country are grateful). It was presented in gold and silver, and is worn at the button-hole, suspended by a black ribbon with dark yellow borders. 2. The Military Medal of Honour, also called Medal of Valour or Merit. It was founded by the Emperor Joseph II as a reward for sub-officers and privates, and is divided into gold and silver medals, according to the respective degree of merit and distinction. 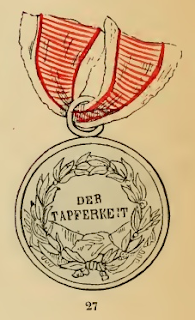 To the first is attached an increased pay of fifty per cent; the medals may be worn even after the owners have quitted the military service, in which case the possessors of the golden one enjoys the additional amount of half-pay connected with it. On the obverse (No. 28) is seen the effigy of the Emperor with his name, and on the reverse (No. 27) the inscription : "Der Tapferkeit" (To valour), surrounded by a laurel wreath. It is worn suspended by a ribbon of red and white stripes. At the death of the owner it passes to his heirs, who have the option of exchanging it for money, in which case the War Treasury pays for the golden medal 35 fl. 28 kr. (about £3 105.) ; or for the silver, 1 fl. 26 kr. (3s). 3. 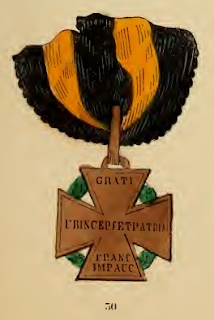 Cross of Honour for Military Chaplains, was founded by the Emperor Francis I on the 26th November, 1801, for spiritual duties performed on the field of battle under perilous circumstances. It is worn suspended by a striped ribbon of red and white, has the form of a square cross, and is edged with trefoil leaves. 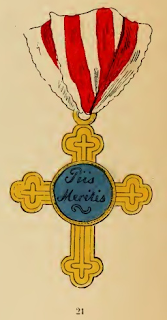 Upon the round scutcheon are the words : "Piis Meritis" (For pious services). (No. 21). 4. 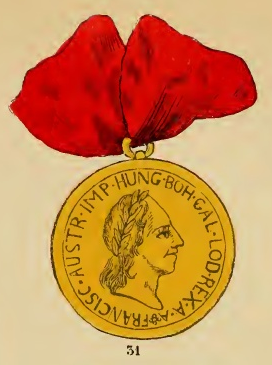 The Civil Medal of Honour is of gold and of three different sizes, and is conferred on individuals of both sexes. The largest exhibits, upon the obverse, the effigy of the founder, the Emperor Francis I, with the inscription : "Franciscus Austrise Imperator", while the reverse represents a temple, with the inscription: "Austria ad imperii dignitatem evecta" (Austria raised to Imperial dignity). The two smaller medals show on the face the effigy of the Emperor, with the inscription : "Franciscus Aust. Imp. Hun. Boh. Gal. Lod. Rex. A. A." (No. 31), the reverse, the Scales of Justice, Sceptre, and Mercury's staff, and above them a crown with the inscription : "Justitia Regnorum Fundamentum" (Justice is the foundation of empires). 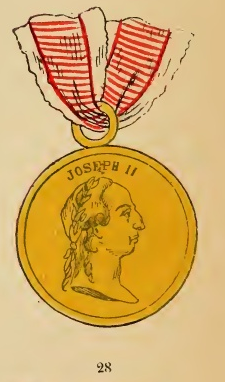 These medals are worn on the left side of the breast, suspended by a red ribbon. Of particular distinction is the great medal suspended by a golden chain. 5. 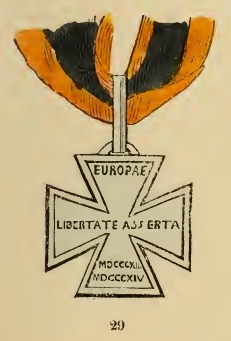 The Cross of the Bohemian Nobility. It was conferred, 1814, by Francis I on those of the Bohemian nobility, who had formed, during the war of that year, a volunteer body guard, which accompanied the person of the Emperor throughout the whole campaign. It is bestowed on no one else. It is red enamelled, bears in the centre the white Bohemian lion, with the inscription : "Nobilibus Bohemis bello gallico fidis corporis custodibus Franciscus Augustus, MDCCCXIV". It is worn on the left side of the breast, suspended by a ribbon of three equal stripes, red in the middle and white at the two extremes. 6. The Military Decoration of 1814 (No. 30), is a cross of the same shape as the Civil Cross of Honour, but rests, in distinction, on a laurel wreath; is cast from the French guns captured in the war, and is worn at the button hole suspended by a dark yellow ribbon with black borders. 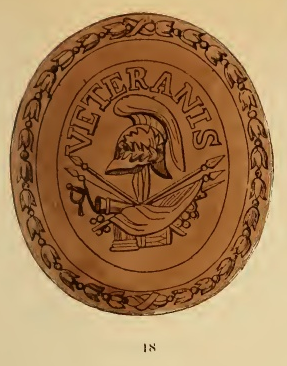 It belongs indiscriminately to all uniforms of the military who served during the campaigns of 1813 and 1814, and may be worn by them even after their retiring from service. The owners are also allowed to have their names engraved on the edge of the Cross. There were originally only one hundred thousand of them manufactured, viz. four thousand large, six thousand middling, and nine hundred thousand small ones. The number has since, no doubt, considerably increased. 7. The Distinction and Badge of Confidence. 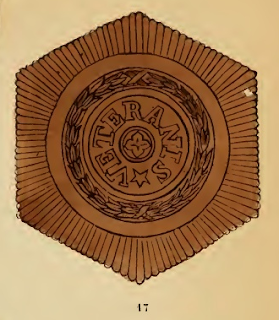 To mark the merit of soldiers from the degree of sergeant downwards, as also to promote re-engagements in the army, distinction plates were introduced, worn on the left side of the breast. Native soldiers may receive them when still in service, or have re-enlisted after having completed the prescribed term of service. The forms are : form No. 18 for the first, and form No. 17 for the second re-engagement.